All shares in Master Dancer include a complimentary welcome pack, including photos of your horse, welcome letter, membership certificate and Club badge for use on racedays. A son of the excellent young sire Mastercraftsman, Master Dancer is the flagship horse for the Select Racing Club, having won five times, the latest of them coming at Cheltenham, where he won a 21-runner handicap by a hugely impressive 10 lengths! Just an eight year old, his best days lie ahead and he is a tremendously exciting prospect. 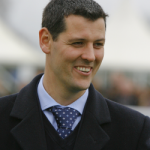 Tim Vaughan is one of the UK’s leading jumps trainers, with over 700 winners in his career to date. Club Manager Nathaniel Barnett was Tim’s Assistant Trainer for over two years and is now involved in sourcing many of Tim’s horses in his role as a bloodstock agent, so he knows the yard very well and it is tremendously exciting to have such a good prospect as Master Dancer in training with one of top National Hunt trainers. Tim and the team are always very welcoming at our regular gallops mornings and we look forward to plenty more enjoyable and successful days with the Master Dancer syndicate, both on and off the racecourse! * Owners badges are on a ballot basis. However, for the majority of race meetings, an owners badge is guaranteed, either free of charge or at a discounted rate, both of which still allow entry to the paddock and winners’ enclosure.